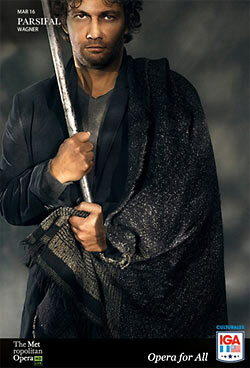 Parsifal has been praised as the most inspiring music composed by Wagner as well as his most controversial composition. The hypnotic music and the depth of the plot have attracted many different audiences; the plethora of divergent views about the work continues to emerge as scholars, performers, critics and the public discover new facets in this enigmatic masterpiece, while others consider it full of ambiguities. Of all the operas composed by Wagner it is one of the longest, while its libretto is the shortest. Completed in 1882 and premiered the same year at the Bayreuth Festival, Parsifal was the culmination of a long career; Wagner himself called it “my last card,” as Kinderman reminds us. Early in his life, Wagner was attracted to the suffering of Amfortas but the composer was apprehensive about the dramatic potential of the legend; the subject of Parsifal was in his mind for more than four decades. Wagner spent more than 30 years to complete the text, although the time devoted to the musical composition was around five years. 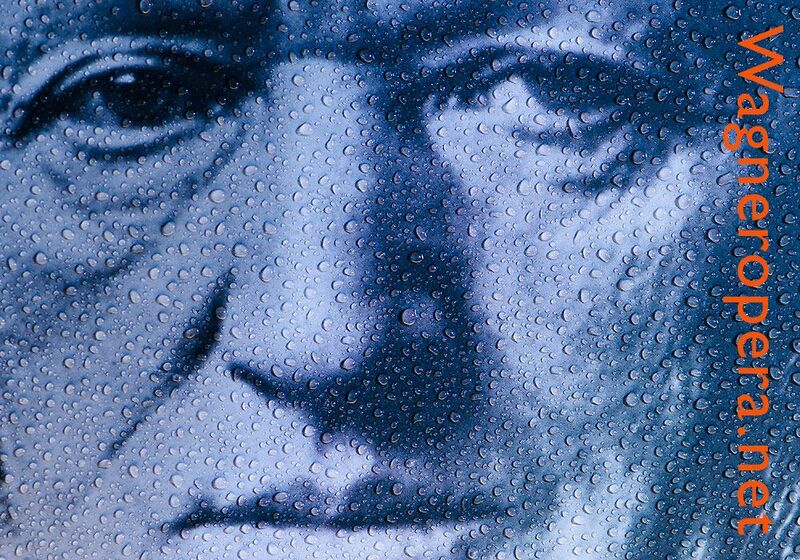 Parsifal was conceived by Wagner to fit the acoustics of the Bayreuth Festspielhaus. Professor William Kinderman has given us a most comprehensive analysis of this complicated work. Just few years ago, he and his wife, Katherine R. Syer, edited an impressive collection of essays prepared by a select group of scholars, under the title A Companion to Wagner’s Parsifal (Rochester, NY: Camden House, 2005). Kinderman has the ideal qualifications to undertake an in depth analysis of this Holy Grail of the music repertory. He is professor of musicology and is the head of the Music Education Division at the University of Illinois. After obtaining a PhD at the University of California, at Berkeley, he studied philosophy at the University of Vienna, and piano, music theory and music history in Vienna and at Yale University. In the late 1980s, he published his dissertation on Beethoven’s Diabelli Variations and later he made a recording that includes a lecture recital (available as a CD in Hyperion and MP3 in Arietta). In 2009, the award-winning Broadway play “33 Variations,” which was written by Moisés Kaufman and included Jane Fonda as the leading actor, was substantially inspired by this work. Alfred Brendel called Kinderman a “very rare bird” to signal his impressive variety of interests in philosophy, musicology and performance. Inspired by Schiller, Beethoven, and certainly, Wagner, Kinderman believes that “art brings together the thinking and the feeling sides of human experience, creating a synthesis of the rational and the sensuous.” Kinderman has taught in Berlin, London, Munich and Paris, and has participated in numerous seminars and workshops organized by several American Wagner Societies and the Wagner Festival at Bayreuth. The book is scholarly written and constitutes an expansion of many of the subjects that were succinctly presented in the 2005 Companion to Wagner’s Parsifal. The volume consists of two main parts, the process of composition, and the musical form and dramatic meaning of the work. 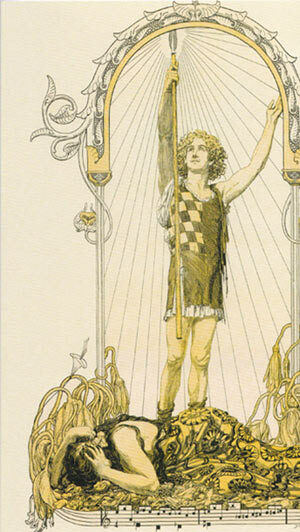 Both parts are heralded by a Prelude called “Parsifal as Art and Ideology.” The book contains 77 musical examples, some figures, and 16 plates, including two famous illustrations by Franz Stassen (unfortunately in black and white), although it is mentioned that Oxford has created a pass-word-protected web site with color images of four of the plates that accompany the book. The jacket of the book has an attractive illustration of the young Wagner, courtesy of Naxos of America; on inquiry, Naxos said that the original is owned by Naxos Hong Kong; it is an oil canvas painted by the Chinese artist Chain Ben-Shan in 2000, on the basis of an 1865 photograph. He has made other covers for Naxos (Liszt, Beethoven, and many others). We expect that in the near future Oxford University Press will issue an affordable new paperback edition after amending some entries in the index and bibliography. No doubt, this short but dense and expensive volume may discourage the general reader who just browses the book and notices the numerous musical examples and a lot of quotations in German, although these quotations are followed by the corresponding English translation (some of them provided by the author). Nonetheless, just a simple look at the first pages of the “Prelude” dissipates many fears. There, Kinderman reminds us about Wagner’s captivation by the legends of the Holy Grail and then traces the connections not only to Lohengrin but to other of his major works, from Die Feen (The Fairies, 1834) to the Ring. Then he shepherds us through the intricacies of the work, penetrating the details of the process of composition of the text and the genesis of the music. The delicate treatment of the various components of such a complicated work is not only rewarding, but after the reader finishes the final section of the book, titled “the sense of an ending,” realizes that the book is much more than the sum of its parts. Kinderman devotes only a few pages to the staging of Parsifal. By contrast, the Companion to Wagner’s Parsifal mentioned above, has an excellent 62-page survey written by Katherine R. Syer; it includes many of the most important productions staged up to 2002. Jacques Derrida and other French philosophers have provided us with a particular approach called “deconstructionism” particularly to study major literary works. That approach gained a lot of attention later among theatre and opera directors, many of them branded as belonging to the Regietheater school. Here, in this book, Kinderman adopts a new approach, also of French origin, called “la critique génétique” (‘genetic criticism,’ also known in English as ‘genetic editing’). This methodology is an interdisciplinary approach that aims at “reconstructing” the sequence of actions that produced the final work of art, thus providing a new gestalt and a more comprehensive view of the entire complex work. By applying this novel methodology, Kinderman makes a reevaluation of the genesis of this important work and demolishes many traditional views about Parsifal. He finds, for example, that the highly praised analyses made by Alfred Ottokar Lorenz “through the segmentation of Wagner’s vast musical continuities into a succession of symmetrical forms,” fail to reveal “the evolving dramatic context of Wagner’s music” (page 4). Using the critique génétique approach, Kinderman follows perfectly the scheme adopted by the Oxford series called “Studies in Musical Genesis, Structure and Interpretation.” The author sees these three components as lying on a continuum and highlights the importance of the third dimension: interpretation. Reconstructing the genesis of the work, Kinderman studies also in great detail the history of the reception of Parsifal and advises us “to beware of exaggerated interpretations, which in extreme cases collapse the artwork into a mere vehicle for religion or nationalism” (page 42). Of course, he recognizes that “music lacks defenses against ideological abuse, particularly music bound up with a ceremonial dimension, as Parsifal” (ibid). Kinderman’s account of the process of the composition of the poem is a comprehensive synthesis of the lengthy effort made by Wagner in considering and exploring a large amount of different sources; Wagner’s favourite one was Wolfram von Eschenbach’s, of which he had no less than four editions and translations in his personal library at Dresden. Of all the works composed by Wagner, there is an abundance of details about the composition of Parsifal; Kinderman reminds us that in addition to the detailed notes written by Cosima in her diaries, there are the composer’s records, and the voluminous correspondence between Wagner and his friends about this new work. The only major missing part is the abundant correspondence between Wagner and Mathilde Wesendonck, which was substantially destroyed by Cosima. It was Mathilde who introduced Wagner to the rich Spanish literature, particularly Calderón de la Barca, which gives an important role to the notions of duty, honour and valour; “my reading is, at present, confined to Calderon,” Wagner wrote to Liszt (1 January 1858). This was also a fertile period when Wagner came more interested in Indian philosophy and Buddhism, and years later, when he read Schopenhauer for the first time, he found in the German philosopher a rigorous explanation of many of the ideas that Wagner had ruminated on earlier. This was also the time when he was working on the prose sketch for his Buddhist opera Die Sieger (The Victors). After presenting the numerous diverse events and circumstances that inspired Wagner in the writing of the poem, Kinderman asks the central question of his book: “How did Wagner successfully create ‘another main interest’ in the character of Parsifal”? And his answer is very clear and direct: “Wagner treated his Parsifal drama essentially as a type of Bildungsroman [a learning chronicle] with the education of the hero prolonged over the course of the drama” (page 60). It is the process through which, according to the Grail prophesy, “made wise through compassion the innocent fool; wait for him, the one I choose.” The key concept here, Mitleid, which unfortunately is sometimes translated as ‘pity,’ is a central subject in Indian philosophy and Schopenhauer took it from Buddhism. The original Sanskrit word Karuna refers to the ability to feel genuine and serene compassion for others; compassion helps to have full control over the fluctuations of the mind and consequently it is a powerful instrument to acquire wisdom. Undoubtedly, Wagner was familiar with these concepts, even before discovering Schopenhauer. Modern neuroscientists have found that the brain of experienced meditators produces gamma waves when they feel compassionate; gamma waves are high-frequency brain waves that lie beneath higher mental activities such as consciousness and true and unconditional love. It was that feeling of compassion that helped Parsifal not to be seduced by Kundry’s kiss and it was through compassion that the wisdom gained by the fool boy assisted him to identify his duty (his “Dharma” in the Indian tradition) and to prepare him to become the new head of the Grail community. The author reminds us that the first music that Wagner composed specifically for Parsifal was the chorus of the “Flower Maidens” in act II and says that “It is interesting that Wagner’s first music composed for Parsifal should have been associated with the United States. … the song has a decidedly saccharine flavor, which Wagner may have thought characteristic of America, since he wrote “Amerikanisch sein wollend!” (Wanting to be American!) on his sketchleaf, dated ‘9 Febr. 76,’ [the time Wagner began to work on the commissioned Grosser Festmarsch, the American Centennial March]” (page 91). Kinderman tells us that in composing the central music for the Grail, Wagner made use of some earlier musical items, particularly the Dresden Amen and its complement, the “Faith motive,” as well as the “Communion motive” which was borrowed from the Franz Liszt cantata “The Bells of Strasburg Cathedral.” Kinderman had access to the original sketch manuscripts, many of them preserved in the Wagner Archive at Bayreuth. He analysed the original sheets containing thirty staves, as well as the inks used by Wagner in order to establish the perfect chronology of the work. The author includes in his book various bits and pieces of manuscript that Wagner cut out of his main working sheets as he thought of new musical ideas; one of the examples has a reconstructed worksheet made from five manuscript fragments. It is as if Kinderman was completing a puzzle (Plate 3 on page 86). As a result of his arduous investigation, Kinderman concludes that “the musical genesis of Parsifal, and particularly the evolution of the transformation music, reveals how Wagner sought to equate the development of music with the development of the entire drama” (page 192). One interesting subject that has called the attention of this reader is the use of the Grail temple bells. Kinderman tells us that by March 1879, Wagner played for Cosima “the wonderful transition to the bells” (Wagner’s own words), which is “the passage leading from the Good Friday Spell to the Funeral Procession for Titurel and the change in scene to the Temple of the Grail” (page 167). This is one of the best examples of Wagner’s genius to labour with musical transitions. The Grail temple bells, outlining the fourths C-G-A-E (Do, Sol, La, Mi) are derived from the processional march and have an hypnotic character. It is interesting to mention that the carillon at the Riverside Church in Manhattan, New York, which was a gift from the late John D. Rockefeller, Jr., has a drum mechanism that automatically plays the four notes (C-G-A-E) from Parsifal’s march every 15 minutes; the bourdon bell, the largest and heaviest carillon bell ever cast, sounds the hours. Many works about Wagner’s operas, and in particularly about Parsifal insist on the “Schopenhauerian-Buddhist influence” and do not distinguish between the two components. Today, scholars recognize that there are important differences between Buddhism and Schopenhauer and express their admiration for the skilful knowledge that Wagner had about Indian philosophy. The academic journal Wagnerspectrum,published by the Richard Wagner Museum in Bayreuth, has devoted its central section to the subject of Wagner and Buddhism with excellent articles by Pandit Bhikkhu, Dieter Borchmeyer, Wolf-Daniel Hartwich, Ulrike Kienzle, and Volker Mertens (issue 2, 2007, pages 9-113). Paul Schofield, in his provocative book, The Redeemer Reborn. Parsifal as the Fifth Opera of Wagner’s Ring (New York: Amadeus Press, 2007), affirms that the misunderstanding of basic Buddhist teachings led Schopenhauer to a pessimistic view of human nature and to consider the denying of “the will-to-live,” as an act of renunciation, and as the only way to cease suffering. Such conclusion, affirms Schofield, is against basic Buddhist teachings. Bryan Magee concludes that Wagner “had been a Schopenhauerian in many, if uncoordinated, ways before reading Schopenhauer” and that Wagner, even before Freud, gave “the supreme importance of raising the contents of the unconscious to consciousness” (The Philosophy of Schopenhauer, New York: Oxford University Press, 1997, page 366). Among the first texts of Indian philosophy that were available in the Western world are the Bhagavad-Gita, the better known part of the Mahabharata (translated into English in 1785 by Charles Wilkins and then into French, German, and Latin), and the versions of the Rig Vedas in Latin by Friedrich August Rosen (1830) and French by Alexandre Langlois (1838-1851). It is very likely that Wagner was familiar with these texts. Hermann Brockhaus, a German Orientalist and a leading authority on Sanskrit, married Wagner’s elder sister, Ottilie in 1836 and it is known that the two exchanged views about Hinduism and Buddhism. It is also interesting to observe that Wagner and many European philosophers of the time believed in metempsychosis, or the transmigration of souls, also referred to as the reincarnation after death. Kinderman rightly affirms that “the notion of Kundry’s many incarnations and her divided existence between the Grail and Klingsor suggests a connection to the unfinished project [Wagner’s Buddhist opera Die Sieger (The Victors)] (page 64). In the Indian tradition, it is affirmed that every action in the universe has some consequences (the law of Karma) and we have to be reborn to be purified. Referring to Kundry’s death, Kinderman asks here the critical question: “Is hers a death of redemption or an annihilation? Is it release or punishment?” (page 286). In a puzzling note, Kinderman says that “after completing the music of Parsifal in his April 1879 drafts, Wagner’s thoughts turned yet again to loose threads in the sprawling narrative of his complete Ring: ‘Siegfried ought really to have become Parsifal and redeemed Wotan; he should have encountered the suffering Wotan (in place of Amfortas) in the course of his wanderings – but there was no augury for it, and so it had to remain as it is’ ” (page 287). This thought makes an interesting connection between Parsifal and the Ring and that is what sustains Paul Schofield’s thesis that Parsifal is the fifth opera of the Ring cycle, where the most important characters are redeemed: Wotan is reincarnated as Amfortas, Brünnhilde as Kundry, and Siegfried as Parsifal. Plácido Domingo summarizes well the quintessence of Parsifal with these words: “Through suffering, understanding. Through understanding, compassion. Through compassion, love” (Parsifal, documentary film directed by Tony Palmer, Kultur D1850, 90 minutes, 1998), a core idea that was unknown by National Socialism. Wagner’s Parsifal (Studies in Musical Genesis, Structure, and Interpretation), by William Kinderman. New York: Oxford University Press, 2013, x+ 327 pages. Hardcover.